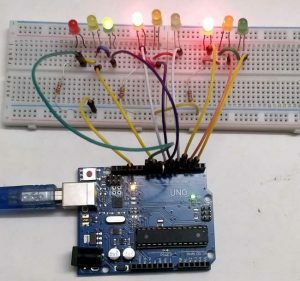 Connect the LEDs in the order as Red, Green, and Yellow in the breadboard. Place the negative terminal of the LEDs in common and connect the 220ohm resistor in series. Connect the connector wires accordingly. 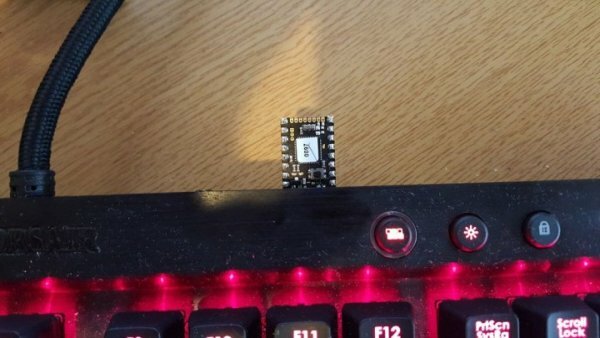 Power up the breadboard using the Arduino 5v and GND pin. 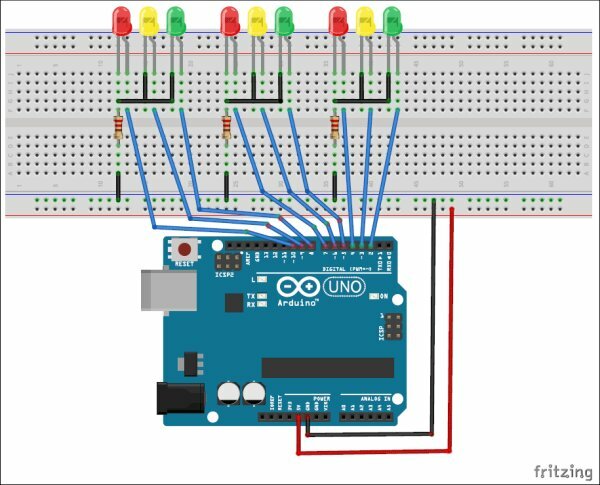 The code for this Arduino Traffic Light Controller Project is simple and can be easily understood. Here we have demonstrated Traffic lights for the 3 ways road and the code glows LED’s on all the three sides in a particular sequence, in which the actual Traffic Lights works. Like, at a time, there will be two Red signals on any of the two sides and one Green light on the remaining side. And yellow light will also glow, for 1 second each time, in between transition from Red to Green, means first red light glows for 5 second then yellow light glows for 1 second and then finally green light will be turned on. In the program, first we have declared pins (2,3…10) as output in void setup() for 9 LEDs (three on each side i.e. forward, right and left side). Then in void loop() function we have written the code for traffic lights to be turned on and off in sequence as mentioned above. This process is well demonstrated in the Video Below. First the upside/forward side is opened (green), while the other two sides (i.e. left side and right side) remains closed with Red signal, with a delay of 5 seconds. Then the yellow light gets turned on at the right side for 1sec followed by the Green light, leaving other two sides (i.e. upside and left side is red) closed with Red Light and 5seconds delay. Then yellow on the left side glows for 1sec followed by green one, leaving upside and right side Red with 5sec delay. This process is looped in void loop() function for continuous process. Here we can modify delays for which the Red, yellow and Green light remain on and off. 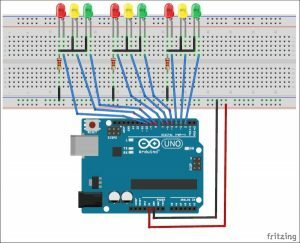 The complete Arduino code and Video for this Arduino Traffic Light Project is given below.